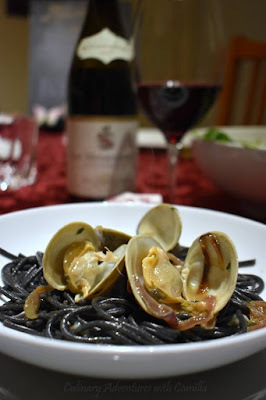 This is a sponsored post written by me in conjunction with the March #Winophiles event. Liz of What's in That Bottle is hosting the French Winophiles this month. She wrote: "There's great variety in the Rhône, from north to south, and it should be a fun wine region to explore. And since our Twitter chat will be scheduled on March 17 -- St. Patrick's Day - perhaps we can consider the delights of Irish food with Rhône Valley wines! Sausages, bacon, Shepherd's Pie ... I can imagine all these would be delish with a Rhône red!" You can read her invitation (here) and her preview post (here). Not only is Liz hosting, but she organized a sponsor to send a group of us bloggers some wine samples. Many thanks to Maison M. Chapoutier for providing us with three different wines for the event. Maison M. Chapoutier's family motto is: Fac et Spera which, in Latin, means 'Do and Hope.' To them, those words encompass their winemaking philosophy and guide their winemaking process. On their website, they list a respect for the terroir ("paying attention... to the world, the environment, anticipating the needs of the earth") then, a respect for the grape ("acting as a merchant for the grapes"), and a respect for the wine drinkers ("aim to always convey the same love of wine...to discover its diversity"). I was curious about the Braille on the label! Here's what I found: In 1993, when Michel Chapoutier had only been the lead winemaker in the family business for a few years, his friend musician Gilbert Montagné discussed his discomfort at going to a wine shop alone. He couldn't read the labels and always felt better when a friend could describe the wines available. With a little research, Chapoutier found it was a fairly simple process to add Braille to his labels. Since then, every bottle of Chapoutier includes appellation, name of the wine, vintage, and whether it's a white or a red wine. Jill from L’Occasion has a different version of the reason based on the original owner of the vineyards who was blinded. Read her post for that explanation! And, after Chapoutier adopted Braille on his labels, other winemakers followed suit. I recently saw Braille on a bottle from Greece...but that is for another post in another wine group. 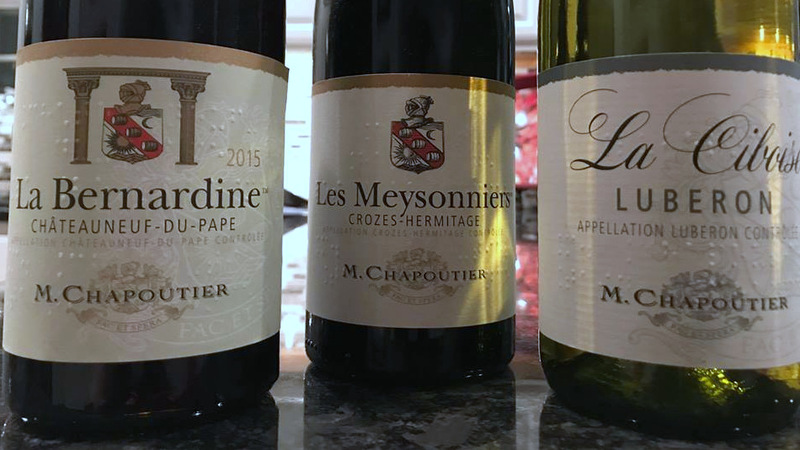 For this event, I received three bottles from them: Lubéron, Les Meysonniers Crozes-Hermitage, and La Bernardine Châteauneuf-du-Pape. * I will share pairings and posts for all of them within the coming weeks, but for today's #Winophiles' event, I am pouring their Crozes-Hermitage "Les Meysonniers." This is a single varietal wine made from Syrah grapes that are, at least, a quarter of a century old. Grown in a blended soil, the grapes are hand-harvested and vinified in a traditional manner with through treading and remontage, also called pumping over. The Crozes-Hermitage is then aged in concrete tanks for about a year. To the eye, the wine is an intense violet hue. Maybe it's a trick of the eye, but the color actually had me getting violet aromas, too...along with rich berry notes. On the tongue, the wine is round and full. It finishes with a tinge of sweet vanilla. Though I initially planned to pair the wine with an Irish stew made with lamb, I decided to play with the sweet and tart and serve it with seafood and a splash of citrus. Success! This was a hit with all. You'll see the Lubéron and La Bernardine Châteauneuf-du-Pape in future posts. But I'll give a teaser and tell you that I served the Lubéron with pork and the La Bernardine Châteauneuf-du-Pape with chicken. Is your curiosity piqued? I hope so. This is a riff on an Irish dish that Jake and I love: Drunken Mussels. But the two Manns of non-drinking age don't care for the alcohol in the dish and asked if we could make it without the booze. And, when I went to the fish market, there were no mussels to be had. So...no alcohol and no mussels; we ended up with sober clams! Add in the fennel and onion. Cook until the fennel is softened and the onion beginning to caramelize. Deglaze the pan with water (you can do this with wine if you aren't making sober clams!). Once the water begins to simmer, pour in the lemon juice and place the clams in a single layer in the pan and add the remaining butter. Cook for one to two minutes, then pour in the cream. Stir to combine, then cover and steam until the clams open. Check them after five minutes. They are cooked and ready when the shells are completely open. Remove the clams and fold the herbs into the sauce. Season to taste with salt and pepper. To serve, I cooked squid ink pasta and placed them in individual serving bowls. I divided the clams evenly into the bowls and spooned the sauce over the top. Sober Clams - hilarious. Nice job on a creative pairing! We love steamed clams at our house and I'm always open to try a new recipe (although I might opt for non-sober!). Thanks Camilla! I prefer clams over mussels anyway (although I won't turn mussels down). I am so happy that the pairing was successful. I think you might have been disappointed had you gone with the heavier dish. I found the Syrah actually paired better to my dessert than my dinner. My curiosity is piqued about the Lubéron with pork and La Bernardine Châteauneuf-du-Pape. But I'm wondering which wine you enjoyed with the Drunken Clams and pasta?!? Haha! Love the evolution of the sober clams. I also love these wines. Chapoutier does such a beautiful job. I never knew the (potential) origin of the braille on the label–thanks for sharing. We use to have the same problem with putting alcohol in our fondue, now my kids are 21+ and not a problem! Look forward to your pork and chicken pairing. I love that you omitted the alcohol of your drunken mussels to make sober clams. We love clams with or without alcohol in our house. Great pairing once again. Thanks Cam! Your creativity seems to know no bounds Cam! A great post and pairing! Thanks for sharing! I love the combination of spices you used in the clams - I'd never have thought of using juniper berries in that way, although I have made clams with a gin broth, so I guess that's similar. Another great food and wine match-up! The clam recipe. Syrah and Clams that sounds heavenly. Interesting that the Syrah works well with the clams, wouldn't have thought of that!